HDD HAS MADE IMPROVEMENTS TO THE P90/PS90 PLATFORM AND IS CONTINUING DEVELOPMENT OF THIS GREAT LITTLE BULLPUP. P90 10.4" BARRELS IN 1 IN 9 TWIST FOR STANDARD AMMO AND 1 IN 7 TWIST FOR SUBSONIC AMMO WITH SILENCER USE. 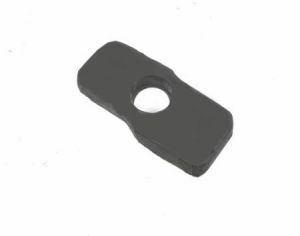 THE HDD P90 BARREL THAT IS HARD MELONITE TREATED INSIDE AND OUT IS THE LONGEST LASTING BARREL MADE FOR THE P90 AND REMAINS ACCURATE MUCH LONGER. THIS BARREL IS THE BEST AVAILABLE FOR FULL AUTO USE. LINED BARREL, FULL AUTO RATED. HDD P90 COMBO MUZZLE DEVICE, APART. HDD P90 COMBO, TOGETHER. HDD P90 COMBO MUZZLE DEVICE ON GUN WITH SILENCER ATTACHED. HDD DEVELOPED SNUFFER P90 SILENCER, MADE FOR THE FN P90 AUTO & PS90 SBR SEMI AUTO CARBINES. THESE HAVE A MONOCORE BAFFLE SYSTEM FOR EASY CLEANING AND IS A DIRECT THREAD 1/2X28 SILENCER. MEASURES 7.5" LONG BY 1.5" DIAMETER AND WEIGHS UNDER 12 OZ. THESE ARE DESIGNED FOR THE P90 CARBINE WITH A EXPANSION CHAMBER AND ONE PIECE MONOCORE BAFFLE THAT HAS 8 CHAMBERS. VERY QUIET, LIGHT WEIGHT AND OVERCOMES THE BURST CASE SCENARIO IN THE P90 CARBINES. A HEAVY STEEL SILENCER WITH A LOT OF BACK PRESSURE CAN CAUSE A BURST CASE PROBLEM DUE TO RESTRICTING FREE MOVEMENT OF THE P90 FLOATING BARREL DESIGN. THE BARREL TRAVELS REARWARD EVERY SHOT WHICH DELAYS THE UNLOCKING OF THE BOLT AND CHAMBER BUT HEAVY SILENCERS RESTRICT THIS MOVEMENT CAUSING EARLY UNLOCKING OF BOLT AND CHAMBER LEADING TO A BURST CASE SCENARIO. A BURST CASE IN A P90 CAUSES THE MAGAZINE TO BLOW OUT OF THE WEAPON AND INJURIES TO THE OPERATOR CAN RESULT. THERE IS NO BURST CASE SCENARIO WITH A HDD P90 PURPOSE BUILT SILENCER. THESE ARE T6 ALUMINUM, HARDCOAT ANODIZED MATTE BLACK, DISASSEMBLE FOR CLEANING AND HAVE A STEEL INSERT WITH THE 1/2X28 THREADS FOR LONG LIFE. BURST FIRE RATED. HDD PS90 SILENCER READY AND CANADA LEGAL CARBINE. PS90 WITH HDD 18.5" BARREL & 1/2X28 MUZZLE THREADS, SILENCER READY. 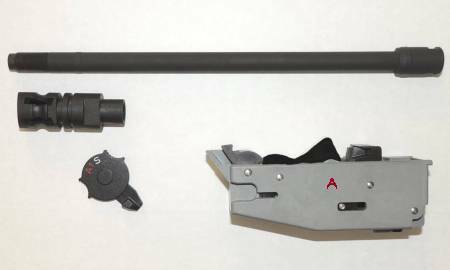 THIS BARREL MOD OVERCOMES THE PROBLEM OF PS90 SILENCER INSTALL, OVERALL LENGTH LAW AND IS ALSO MAKES A PS90 LEGAL FOR USE IN CANADA. HDD MODIFIED PS90 HAMMER PACK, P90 BARREL, P90 FLASH HIDER AND THREE POSITION SELECTOR SAFETY CATCH. THIS KIT CONVERTS A PS90 INTO A SHORT BARREL SELECT FIRE P90.